Valentine’s Day is just around the corner and you may have already made reservations at your favorite restaurant, bought the perfect gift, and have a play-by-play plan of how the night will go. However, is your mouth fresh and ready to pucker up this Valentine’s Day? 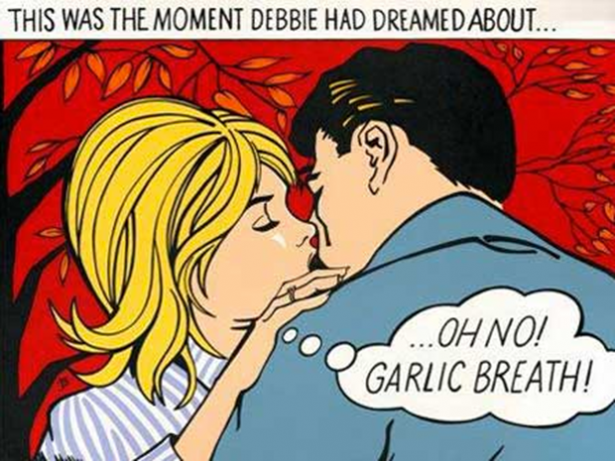 Bad breath is unfortunately a very quick way to put a halt on a romantic evening. Your valentine won’t be rushing to pucker up if your mouth smells like a trash can. Even though mouthwash and breath mints may help you out temporarily, they are not adequate solutions for dealing with the problem at hand. Studies show that bad breath or halitosis can be caused by poor dental health habits and can also be a sign of other health problems in the body. Certain foods also contribute to the problem, as well as other unhealthy lifestyle habits. The horrible habit of smoking or chewing tobacco-based products stain teeth, reduce your ability to taste foods, and irritate the gums. Did you know that saliva is considered to be the mouth’s detergent? By chewing flavored sugarless gum, you can help eliminate the bacteria that cause bad breath. The top choice in flavors for producing more saliva is Strawberry and Cinnamon. For a sweet tasting treat, Strawberry Twist is a great choice. So let’s conquer bad breath with my tips so you can be kiss-ready for your date this Valentine’s Day. After brushing your teeth, scrape your tongue, rinse your mouth thoroughly and gargle with fresh, cool water to get rid of any leftover bacteria. Try to avoid eating or drinking anything for at least 30 minutes after you’re done brushing. If you are constantly battling bad breath, then at mealtimes you should avoid foods such as; garlic, onions, sugary foods, fish and eggs. These foods are known culprits of contributing to bad breath problems. On the flip side, guava, gooseberry and rough foods, like bread, are great to munch on as they can help you in cleaning the back of your throat. Visit the dentist at least twice a year. Bad breath is also caused by other underlying dental problems, so be sure to make an extra appointment if you feel your condition is chronic. Stick with these tips and you will be ready to go for February 14th because having no date can be often more preferable than a date with bad breath. “Dr. G”, is a world-renowned oral health expert. The founder of the Goodwill Oral Health Project, Dr. G is on a one-doctor crusade teaching young dental students in poor and developing countries and communities the latest in dental technologies and procedures to help eradicate tooth decay and other deleterious oral health conditions. He is also an Adjunct Professor of Dentistry and Director of Endodontic Programming for the University of Technology in Jamaica, and is a staff member of the Faculty of Dentistry in the graduate department of endodontics at the University of Toronto. Wonderful article! You have great and practical information, and you are making it lots of fun to learn. Thanks! WOW great info dr. G!!! Thanks for the great info Dr. Gary Glassman Toronto!